To parent a child is to undertake a God given ministry of the highest order—providing a precious soul with care, nurture, and training in the Lord. 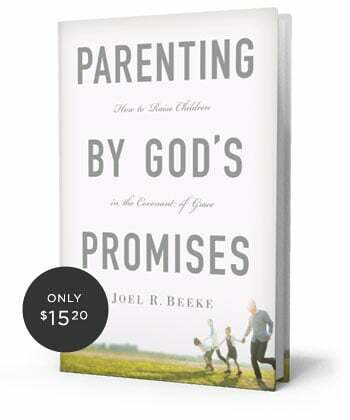 To assist Christian parents, Dr. Joel R. Beeke has written Parenting by God’s Promises: How to Raise Children in the Covenant of Grace. Using Scripture as his foundation, Dr. Beeke offers practical wisdom for parents on topics such as instituting and leading family worship, teaching children, modeling faithful Christian living, and exercising discipline. Parenting by God’s Promises is available now. How long have you studied and taught the subject of parenting? I’ve been counseling parents for thirty-three years in the ministry; reading and preaching on the subject of parenting for more than twenty years; and teaching a family class on parenting in our church for four years. What issues does this book address that are not found in most other parenting books? Theologically, few parenting books provide a solid Reformed foundation for parenting, emphasizing God’s gracious promises to believing parents and their children in the covenant of grace. Practically, few parenting books address how Christian parents share in the anointing and threefold office of Christ as Mediator, and should function as teaching prophets, interceding priests, and guiding kings in the home. Also, few Christian parenting books deal with the common challenges of parenting, such as teaching children to listen, taming their tongues, and handling sibling relationships. Finally, few parenting books have chapters devoted to helping teenagers discern God’s will, resist negative peer pressure, and manage their anger. Why do most books on parenting tend to leave parents feeling guilty instead of helping them? They focus too much on mandates or imperatives, on what parents must do, without relating that to God’s fatherly love, His forgiveness in Christ, His promise of the Holy Spirit’s power and guidance, all aspects of His covenant of grace with us, as the bedrock of parenting, which truly provides help. How does knowing the gospel apply to being a parent? In a thousand ways, of which here are three: First, we must show unconditional love for our children as the fruit of Christ’s unconditional gospel love for us. Second, we should not be shocked when our children sin, for the gospel teaches us that we are all sinners. We must not disown our children for sinning, either, for Christ does not disown us as sinners. Finally, the gospel teaches us that we must continually be exercised in the gospel if we are to progress in our growth in grace to God’s glory. One of the greatest means of such grown is to strive to rear our children in the ways of the Lord. Repeatedly in the gospels, Christ uses children to bring parents to Himself. Think, for example, of the father of the demoniac in Mark 9 and the mother of the Canaanite woman in Matthew 15. You identify three types of problem parents: consensus administrators, horns of plenty, and wishing wells. What are the results of such parenting? How should parents see themselves? Consensus administrators run their household by majority vote. Children do not learn submission to authority in such households. Parents who are horns of plenty shower their children with money and gifts. Rather than showing true love, this type of indulgence usually produces self-indulgent, demanding, and ungrateful children. Parents who are wishing wells are ruled by their moods and feelings. These moods are so unpredictable that children never know how their parents will respond to their requests. This tends to destroy their children’s trust, and offers opportunities for them to manipulate their parents to further their own agendas. Instead of following these worldly and unwise models, parents should see themselves as representatives of Christ, seeking to train their children in a scriptural manner consistent with how they believe Christ wants them to raise them. What are some practical areas in which you offer help for parents of teenagers? I try to offer parents help in areas that surface in day-to-day parenting. That includes answering questions such as: How can we as parents train our children to treat their siblings with Christ-like love? How can we help our children learn to discern God’s will in life’s major areas, such as choosing a career and choosing a marriage partner? How can we help our children fend off negative peer pressure and become strong models of positive peer pressure for their friends? How can we help our teens cope with anger? What steps can we take to prepare our children for leaving home and for marriage?